10 Fun Things To Do When the Pool is Closed! As you know, the pools and assisted changing rooms are closed from July 30th - Aug 13th. Which also means no drop-in aqua classes at this time. But hey, no pool? No problem! Here are 10 things to do while the pool is closed. 1] Dance! - Try our Zumba class! Take the ‘work’ out of workout and have fun dancing! Our high energy Latin-inspired exercise routine with easy to follow steps. It is the “feel happy” aerobic workout that will tone your body from head to toe while enjoying a new way to stay in shape! View our drop-in class schedule here. Did you know that we offer 7 different yoga options? Let us help find the right fit for you! Check out more information here. A comfort zone is a beautiful place, but nothing ever grows there. We have plenty of yoga classes to help you feel comfortable and which can improve your balance and flexibility. Put a fun spin on your workout with a virtual cycle class! Maximize your calorie burn and increase cardio and muscle endurance with a unique mix of sprints, climbs, intervals, drills, terrain and technique training, to challenge you in every class. 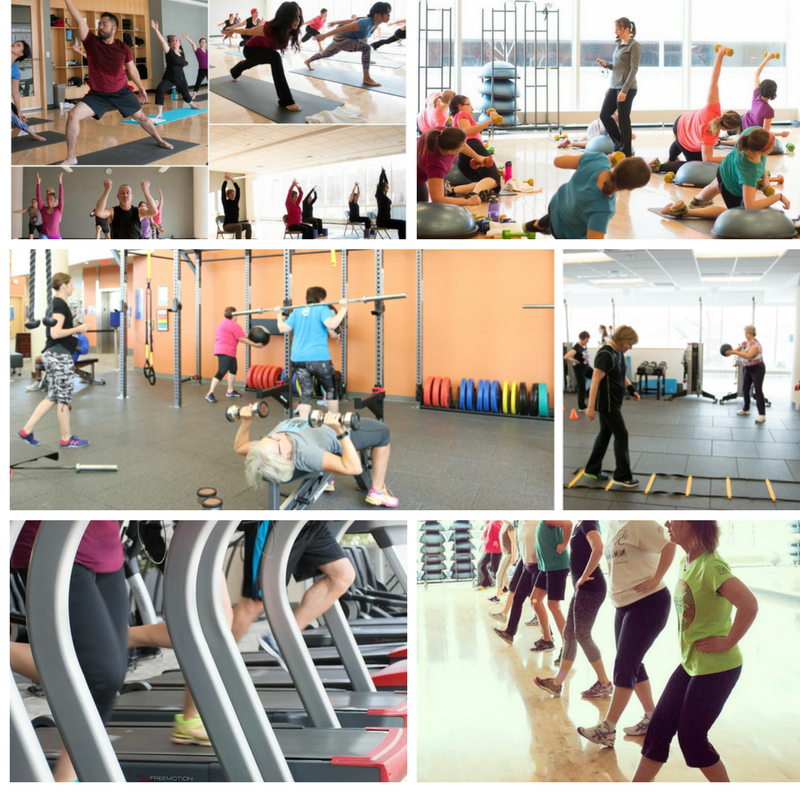 A monthly schedule is available online here and in the cycle studio. Group Training is a great way to help you work towards your fitness goals. This free, 6-week service provides you with the opportunity to work with a Health & Wellness Coach in a small group environment (2-6 members) that provides support, motivation and accountability. Each session focuses on strength, cardio and flexibility and will meet once per week for 6 weeks up to 60 minutes per session. Attendance is required for all sessions, and you are responsible for completing the workout at least one time on your own per week. This class is designed for active older adults. Participants will be led through a variety of exercises that will challenge the body’s strength, coordination, stability, and cardiovascular health. Class size limited to 10. We also have an AOA Core & Balance and AOA Mixx class available. Click here for more details. Wondering where to start or what to do while the pool is closed? We've got you covered! Try a basics class! We have tons of different offerings and are sure to have a class that fits your interest and is based on your area of focus. You will work with a Health & Wellness Coach as they will introduce you to the proper form and technique of the exercise. Learn more here. Learn while you burn and build some mental strength with podcasts, audiobooks, or TED Talks. It allows you to get in “the zone” of your workout while your mind can zone out somewhere else. This is a great productivity mind hack that keeps you company while you put in work doing two things at once, making you feel twice as good - it's a win-win! Focusing on what the speaker is saying distracts you from counting down the time and thinking about when your workout will be over. You may even find you'll continue to workout because you're so interested in what you're listening to! 8] Challenge your muscles with this workout in our free weight area! It’s a quick, full body workout to help YOU feel comfortable in the free weight area. Get creative and change machines every five minutes for a 30 minute cardio workout. Knowing you won't be in one spot for long frees your mind and keeps you from getting bored or complacent - you can do anything for five minutes! Walk around the track: 5 minutes. Wow, was that 30 minutes already? This is a great way to add variety, push yourself and cruise through your workout. Add your favorite tunes for best effects! Lace up those running shoes, change up the scenery and take advantage of the gorgeous (yet limited) summer days we have here! Head outside for a nice jog or walk (or combination of the two) and you may not even miss the pool while you're out and about! This is another great time to break a mental sweat with a podcast episode, call a friend to catch up, or even return work phone calls so you don't have to worry about them later on! And remember to stop by our Wellness Stop on Wednesdays between St. Marys and the downtown campus for some water and trivia while you walk/jog. We hope you take this time to challenge yourself and explore the unique variety of opportunities we have available for you here at the DAHLC. Hey who knows… maybe you'll find a new activity you thoroughly enjoy - you never know until you try! Again, we want to thank you for your patience and cooperation as we continue to keep our facility state-of-the-art and safe for your enjoyment. The pool will reopen and resume normal operations and schedules on August 14th.